The National Significant Wildland Fire Potential Outlook report released March 1 by Predictive Services at the National Interagency Fire Center has some good news and some bad news for the outlook period covering March through June. Recent winter storms that dumped much-needed moisture in the High Country may also contribute to above-normal fire activity as grasses and undergrowth dry out later this spring. Across the southern Rocky Mountains and the Southwest, snow and precipitation finally occurred to help mitigate some of the fuels concerns for the short term. It is likely that as spring and summer develop, moisture deficits will play a role in drying fuels more quickly than normal, possibly leading to above normal pre-greenup fire activity, especially in the finer fuels. For March, the Climate Prediction Center at the the National Interagency Fire Center expects a higher probability of above normal temperatures in the eastern half of U.S. and extending toward the Southwest. Below normal temperatures are favored across the West Coast, the northern Great Basin, the northern Rockies. Colorado is predicted to have normal temperatures. 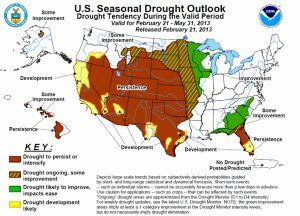 The drought is expected to persist in Colorado. For April through June, Colorado is predicted to have above normal temperatures and below normal precipitation. Recent snowfall across the Area brought short term relief from drought conditions, especially east of the Continental Divide. Significant fire potential for April and May through June is expected to be normal. Medium range forecasts for early March point toward a still active weather pattern for the Rocky Mountain Area. While precipitation probabilities are high in northern portions of the Area, a somewhat drier weather pattern is anticipated across the southern portion of the Area. However, it is expected that occasional cold frontal passages will carry a chance of some precipitation. Longer range predictors for the end of March through April suggest temperatures and precipitation will be closer to average.